The Rockets added Mike D'Antoni and trimmed away their half measures, going full throttle on offense and shooting up the NBA standings. At the heart of it all was an idea. What if the great fault of the 2015–16 Houston Rockets, peevish and middling, was a reliance on half measures? Houston had run the break, but so inconsistently as to rank seventh in pace—only slightly faster than the league average. The ball was put in James Harden’s hands, yet Dwight Howard still insisted on diverting the offense into token post-ups. Harden, to be fair, also took months working his way into primary ball-handler shape. No team in the NBA attempted more three-pointers last season proportional to their total offense, but Houston ultimately created those high-value shots for an underwhelming collection of shooters. The Rockets took stock of that performance—which resulted in a .500 record and obvious discontent—and saw a design worth amplifying. The problem wasn’t the speed or the star or the shot selection. It was the lukewarm commitment to each as an idea. Houston’s solution was to take a flawed team full bore, and in that saw fit to hire Mike D’Antoni. From that expertise came the notion that James Harden, a three-time All-NBA player, had yet to assume his optimal position. 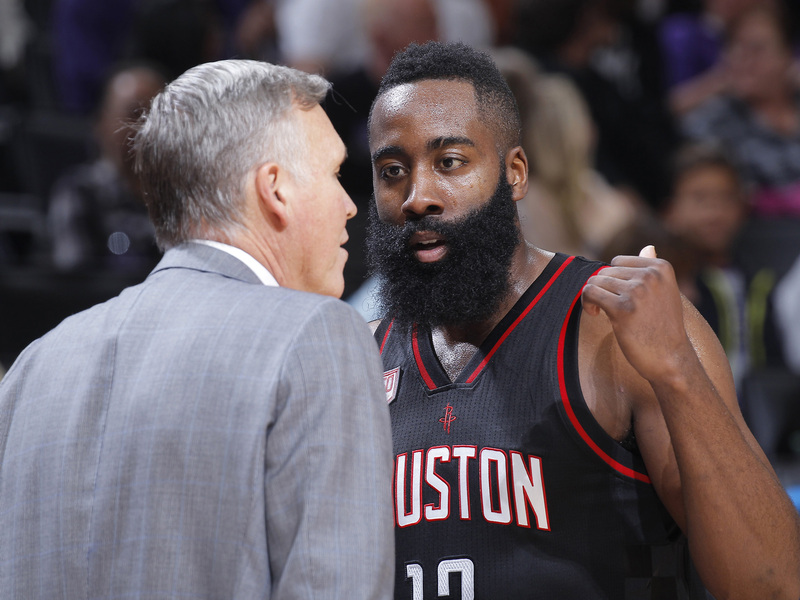 “That,” D’Antoni admits, “was done with some reservations.” For years Harden had worked as Houston’s de facto point guard, but never its literal one. Harden focused his game accordingly. Uncommon vision and undeniable gravity made him a playmaker all the same, though the internal priorities of Harden’s game always tilted toward scoring. When an unstoppable driver is also a proficient shooter and a genius in creating contact to draw fouls, there is an understandable temptation in letting that player create first for himself. The output hasn’t changed (Harden’s scoring and usage rate are effectively identical to last season), though the disposition has. James Harden, point guard, is currently leading the league in assists at 11.9 a game. Nearly half go toward three-pointers, meaning that in the final accounting, Harden is responsible for around 60 points per game as a scorer and passer. The genesis of the move, D’Antoni said, was a matter of playing time economy. ​Houston had created an ecosystem so reliant on Harden last season that he wound up leading the NBA in minutes played. D’Antoni saw a superstar on film wearing down at the end of games and an untenable career trajectory. “How can we cut out the fat?” D’Antoni asked. “Because there's a lot of times where he's just standing over in the corner or just standing somewhere not being involved where the team really needed him to be the facilitator.” The toll was in the little things: running the floor, tracking a cutter, trying to move without the ball. D’Antoni’s solution, in retrospect, was quite elegant. By making Harden the operative force on as many possessions as possible, Houston draws the most out of what makes Harden a superstar. Where it trimmed were in all the areas where a surrogate could do just as well—an arrangement that has maximized Harden, the shooters around him, and the supporting ball-handlers who now carry the offense in Harden’s absence. Eric Gordon and Patrick Beverley are great Harden complements who moonlight as second-unit creators. Playing even a few minutes without Harden—and thus without a clearly superior option—on the floor grants them license to fire away. With that freedom, Gordon attempts eight more shots per 36 minutes than he does as Harden’s courtmate. This leaner role puts the ball in Harden’s hands for roughly three more minutes per game, according to NBA.com, even as he plays nearly two fewer minutes overall. That three-minute difference in possession time, for reference, is the margin between the possession-eating Russell Westbrook and the egalitarian George Hill. Harden is that much more involved than he was a season ago, fulfilling a core tenet of D’Antoni’s basketball philosophy: Let’s take our best stuff and go to it as often as we can. That difference, with proper support, has resulted in the most efficient offense D’Antoni has ever coached and the most prolific three-point shooting outfit in NBA history. Houston added both Gordon and Ryan Anderson in the off-season, effectively importing the infrastructure of a 30-win Pelicans team. It wound up a contender because of it; health and fit have completely revitalized Gordon’s career, while Harden’s playmaking has activated Anderson’s shooting in a much more potent way. A floor-stretching power forward shooting 37% from three, as Anderson did last season, is nice, but the kind of threat an opponent can live with. A floor-stretching power forward shooting 41% on almost seven long-range attempts per game requires a slightly different calculus—especially when he’s able to post that kind of threat from several feet beyond the three-point line. Gordon does this, too. Together, Gordon and Anderson (who rank first and seventh in three-point makes this season, respectively) create a strong pull on defenses from a distance slightly further than they’re accustomed. Harden, meanwhile, engages a pick-and-roll at the top of the floor that jumbles an opponent’s coverage and sends two quality finishers streaking toward the rim. The compounding gravity of these actions brings even the stoutest systems to collapse. Harden is one of the most complete drivers in the game, every roll man he works with can catch and finish, and the spacing on the floor goes above and beyond even rising NBA standards. Gordon has hit 98 threes this season from beyond 25 feet (most in the league) and Anderson 64 (sixth)—all because their range puts that much distance between them and the defense’s collapse. “Well, it's not like I told them to stand there,” D’Antoni said. “They started standing there and they started making shots.” That may technically be true, but D’Antoni’s principles empowered Gordon and Anderson to stand there all the same. There’s a reason neither player was spotting up well beyond the arc in New Orleans.